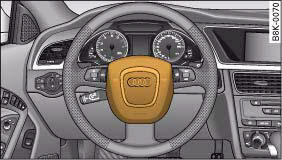 The front airbag for the driver is located in the padded hub of the steering wheel ⇒ fig. 214. 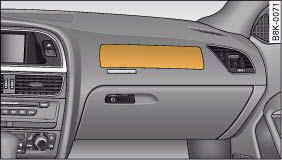 The front airbag for the front passenger is in the dashboard above the glove box ⇒ fig. 215. The locations of the airbags are marked with the word “AIRBAG”. In conjunction with the three-point seat belts, the front airbags give additional head and chest protection for the driver and front passenger in the event of a severe frontal collision ⇒ in “Important safety notes on the front airbag system” on page 204. 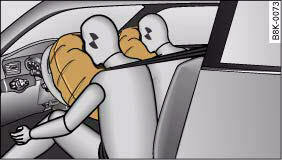 When fully inflated, the airbags reduce the risk of head or chest injury. In certain types of accident the front airbags, side airbags and one of the head-protection airbags may be triggered together. When the system is triggered, the airbags fill with a propellant gas and open out in front of the driver and front passenger ⇒ fig. 216. In order to provide the desired extra protection in an accident, the airbags have to inflate extremely rapidly (within fractions of a second). The fully deployed airbags cushion the forwards movement of the front occupants and help to reduce the risk of injury to the head and the upper part of the body. Special openings in the airbag allow the gas to escape at a controlled rate to restrain the forward movement of the occupant's head and torso. Once the impact has been absorbed, the airbag deflates sufficiently for the front occupants to see forward. • It is important for the driver and front passenger to maintain a distance of at least 25 cm from the steering wheel or dashboard ⇒ fig. 217. The airbag system will not be able to give the required protection if you sit too close to the steering wheel or dashboard. There is also a risk of injury if the airbags are inflated. The front seats and head restraints must always be positioned correctly for the height of the occupant. • If you do not wear a seat belt, if you lean forward or to the side, or are not seated correctly while the vehicle is in motion, you are at greater risk of injury. 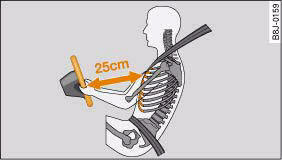 Should the airbag system be triggered in an accident there is an even greater risk of injury. • Never let a child travel on the front seat without an appropriate restraint system. If the airbag is triggered in an accident, the child could sustain serious or fatal injuries, “Child safety”. • Never install a rearward-facing child safety seat on the front passenger's seat unless the front passenger's airbag has been deactivated. However, if you have no alternative but to use a rearward- facing child seat on the front passenger's seat, the front passenger's airbag must be deactivated beforehand by means of the key-operated switch*. Failure to observe this precaution could result in serious or potentially fatal injury. • Occupants sitting in the front of the car must never carry any objects or pets in the space between them and the airbags, or allow children or other passengers to travel in this position. • Do not cover or stick anything on the steering wheel hub or the soft plastic surface of the airbag unit on the passenger's side of the dashboard, and do not obstruct or modify them in any way. These parts should only be cleaned with a dry cloth (or with a cloth moistened with plain water). It is also important not to attach any objects such as cup holders or telephone mountings to the surfaces covering the airbag units. • Any work on the airbag system or removal and installation of the airbag components for other repairs (such as repairs to the steering wheel or removal of seats) must be performed by a qualified workshop. If necessary, you can deactivate the front passenger's airbag by means of the key-operated switch*.